CARY, N.C. – The USA Rugby College 7s Men’s Division I will have a new National Champion in 2016 following Lindenwood’s loss to Arizona State in Saturday’s Cup Quarterfinals, which featured three of the top seeds advancing to Sunday’s Semifinals. 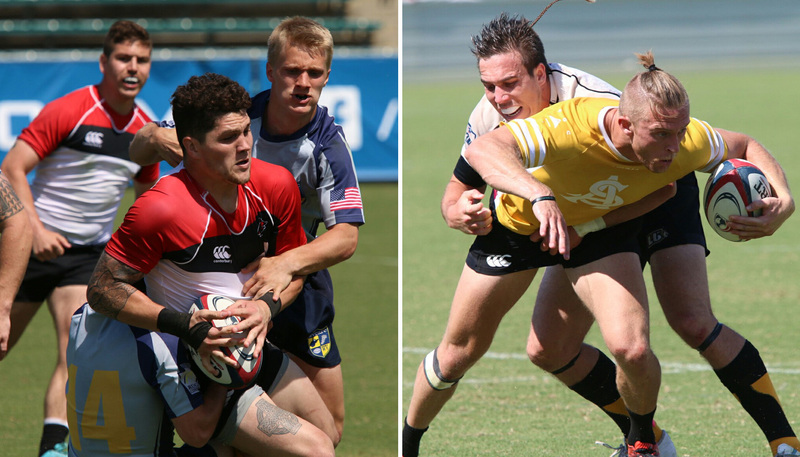 The 2016 USA Rugby College 7s National Championships began at 9 a.m. ET and concluded after 9 a.m. ET, at which time deliberation began regarding a contingency plan for the incoming Tropical Storm Bonnie. The Men’s DI Cup Semifinals will kick off Sunday’s action at WakeMed Soccer Park alongside the Women’s DI Cup Semifinals at 8 a.m. ET. The entirety of Day Three will be broadcast live on The Rugby Channel. The top men’s division concluded pool play early Sunday following two matches Friday afternoon and evening. The Lions from St. Charles, Mo., conceded just 10 points in pool play for a combined win margin of 60-10, yet could not break through a stingy Sun Devils team that blew through its own pool to earn the No. 3 seed. “We didn’t really play the way we wanted to in the first couple of games in pool play,” Arizona State captain Bailey Stringer said following the 24-0 defeat of Lindenwood in the Quarterfinals. “We’re a team that gets better as we go throughout the tournament. We like to improve. Arizona State will go up against second-ranked Saint Mary’s in the Semifinals, with the team from Moraga, Calif., edging Notre Dame College, 21-17, in the knockout stages. Top-seeded Davenport handled West Virginia to set up a date with American International, which shut down a deep, second-ranked Central Washington team, 15-0. Lindenwood and West Virginia were able to rebound to reach Sunday’s Plate Final, while Alabama and San Diego State won both of their knockout matches, and will meet in the Shield Final. Eleven teams made up the Women’s DI competition at College 7s, with reigning National Champion Penn State in a three-team pool with UC Davis and James Madison. Following the culmination of pool play, the teams were seeded based on their best two results, with Life and Penn State ranked at the top of the knockout field. Lindenwood’s 7-5 defeat of Central Washington meant the Wildcats would spend their Quarterfinal as the fourth seed, which suited Stanford just fine. The Cardinal had only lost to Life, and went into the Cup Quarterfinal against the 2015 College 7s Women’s DI runner-up with a secret weapon: being a relative unknown. Maya Theuer, a varsity soccer player at Stanford for several years and a graduating senior this semester, joined up with friends on the rugby squad this season and made the trip to Cary for an incredible two days thus far. She scored the game-winning try in the nail-biting, 21-19, Quarterfinal for a team that returned just five players from last year’s tournament. “She’s a really good addition to the team,” Head Coach Josh Sutcliffe enthused following the victory. “What was really exciting for me was the concept of working in small groups and working together, connecting on offense and defense. “The difference for us is we had some people no one had seen. When we found out we were playing Central, everyone knew what to expect: big runners, stiff arms, speed on the outside, the ability to work together to move the ball wide. It’s a bit easier to mentally prepare for that. #Stanford fight back v. Central Washington to complete the comeback and get the win! Penn State had been tested by James Madison, which held a lead with two minutes remaining in the Quarterfinal, but turned to its younger athletes for the late spark to victory. The Nittany Lions will go up against the Lions of Lindenwood, with the Cardinal facing an even sterner test in the Semifinals with No. 1 Life. The Plate competition will be just as intriguing as the Cup as 15s Spring Champion and the Championship runner-up, UC Davis and Virginia, respectively, could conceivably meet each other again in the Plate Final. Chico State beat Texas A&M in the Bowl Semifinal playoff to face North Carolina, which received a bye with a ninth-place finish from pool play, in the Bowl Final Sunday. The updated College 7s schedule can be found on the College 7s website. The viewing home for the National Championships is The Rugby Channel.